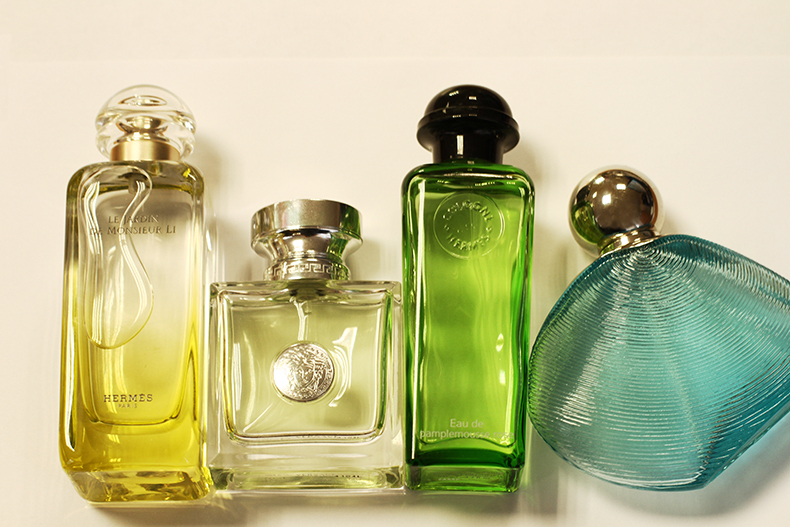 Discontinued fragrance "Aquawoman", Rochas (the first from the right). Those who are interested in perfumes and "how it all works" know, that this "discontinued" makes people go crazy, especially when it comes to fragrances. The scenario is obvious: first no one needs it, then everyone needs it and ready to pay double and triple prices. You can find it on eBay - testers, half-of-bottles, miniatures, and, sometimes, analogues, very close to "Aquawoman" scent, but not the same for 100%. By the way, my intuition tells me, that sometime we will witness the highest ever demand for "Womanity" by Thierry Mugler... And this "sometime" will come as soon as it is discontinued. "Eau de Pamplemousse Rose", Hermes. It's always difficult for me to choose one fragrance from "Les Colognes", because all of them are beautiful and unique in their freshness and story. This one was created for 2 (both man and woman) in 2009 and built upon the citrus and rose notes ( those who know French can see it from the name). "Versense", Versace - another "green" juice, which is not niche, not discontinued, not as "complicated" as Hermes may seem. It's just a good full of citruses fragrance, which I bought long after it was launched (2009). I wonder, why no one suggests it like a fresh fragrance, because it's one of the "freshest" perfumes I've ever heard and trie: not a single note can be added to it, or taken out from it. My precious "Le Jardin de Monsieur Li", Hermes is one of 5 "Les Jardins", and I could mention all of them, but decided to choose the latest one for this post. Kumquats and jasmine, this tasty and unrepeatable mix, that I want to apply and reapply and re-re-reapply it for many many times before autumn wins. It's beautiful in it's shape, color, in it's, of course, freshness, and it's pithiness. Here is my list for Summer 2015. What is yours?